Earth's water may have originally been formed by chemical reactions deep within the planet's mantle, according to research led by University College Dublin. The new theory offers an alternative explanation as to how the life-giving liquid may have originated on Earth. Previously, scientists have suggested that comets that collided with the planet could have deposited large amounts of ice on the Earth which later melted, forming water. The investigators carried out computer simulations which found that reactions between high-pressure and high-temperature fluid hydrogen and silicon dioxide in quartz, found in Earth's upper mantle, can form liquid water under the right conditions. The exercise tested the reaction at different temperatures and pressures typically found in the upper mantle 40 to 400km below the surface of the Earth. The simulations revealed that the silica and fluid hydrogen could form water when exposed to temperatures of just over 1400°C and at pressure 20,000 times higher than Earth's atmospheric pressure. 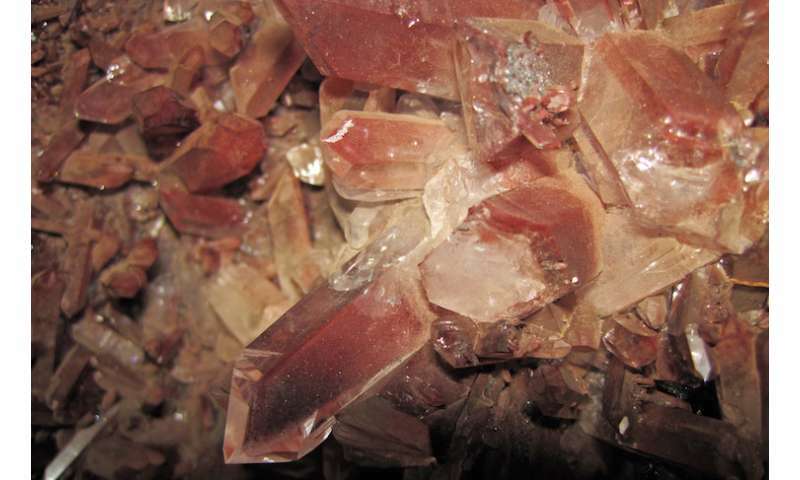 Silica is found in abundance above and below the surface of the earth in the form of the mineral quartz – the Earth's crust is 59 per cent silica. The scientists had expected that the water would form on the surface of the silica, but instead, they were surprised to find that the water remained trapped inside the silica, leading to a massive build up of pressure. They also believe the release of this pressure could be responsible for triggering earthquakes hundreds of kilometres below the Earth's surface. The new findings support the experiments on the same reaction between silicon dioxide and liquid hydrogen carried out by Japanese scientists in 2014. "We were initially surprised to see in-rock reactions, but we then realised that we had explained the puzzling mechanism at the base of earlier Japanese experimental work finding water formation," said Prof English. "We concluded that these findings help to rationalise, in vivid detail, the in-mantle genesis of water. This is very exciting and in accord with very recent findings of an 'ocean's worth' of water in the Earth's mantle. "We thank Science Foundation Ireland and our collaborators at the University of Saskatchewan, and the Ireland-Canada Foundation for 'seeding' this 20-paper collaboration with Professor John Tse ten years ago." The findings were published in Earth and Planetary Science Letters. 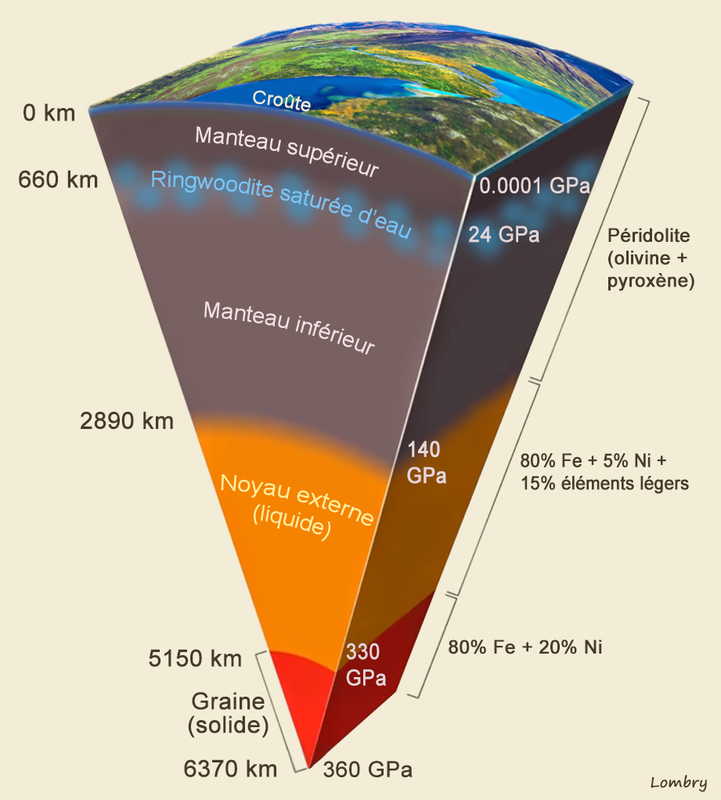 Various studies in recent years have also suggested that vast quantities of water are stored in rocks as far as 1000km below the surface of the Earth. Uh huh. So all the water on every other body in the solar system was formed inside some mantle? Why would they think that stuff such as water and hydrocarbons would have a unique origin here on earth when there is so much of it everywhere?? Uh huh. So all the water on every other body in the solar system was formed inside some mantle? That's not what they said at all. SOME of the water would have formed this way, some would have come from comets and asteroids, some would have been in the original condensing cloud that formed the Earth. It's actually a nice finding, as there seems to be too much water on Earth and Mercury to all have come from comets. If you read the Creation story and the Great Flood of Noah, you would already know this. Because the idea is that there is some kind of a "snow line" in the Solar System, a relict of its formation. Inside the "snow line", water would have been vapourised by the early Sun, and ice wouldn't be able to coalesce with the dust to form proto-planets. Outside the "snow line", however, ice would be able to participate in planet formation. Since we see rocky planets with very little water on one side of the asteroid belt, and significant part icy moons and plutoids on the outside (except for the innermost Jupiter's moons, where heat from formation of Jupiter could have generated Jupiter's own "snow line"), this theory, while it's untestable, does good at predicting the actual state of the Solar System. Where does the fluid hydrogen originate? I would not expect any free hydrogen lasting very long on Earth. No, if you read the Creation story in this day of science and reason and if you are completely sane, you would already know what a load of crap it is and anyone who believes such crap in this day of science and reason is being a complete moron for doing so. Snow line - ...where it is cold enough for volatile compounds such as water, ammonia, methane, carbon dioxide, carbon monoxide to condense into solid ice grains." "Venus was once wet, the ESA scientists knew, not only would the planet's heat cause any liquid water to flash evaporate into the atmosphere, but also the ultraviolet radiation streaming in from the sun would cause the H2O molecules to break down into individual atoms"
-IOW the rocky planets and moons have plenty of water except where their environment drives it off. There is still an ocean of water on mars and a sea of it on the moon. So i repeat: if water and hydrocarbons exist throughout the system, why would the origin of it be any different here on earth? This is not an argument its a statement. There are plenty of very good arguments against this crap. You should learn them if you expect to refute these people effectively. Its both fun and rewarding. Is there deuterium in the mix? If so, at what ratio? Thats exactly what it said. Read it again. Where does it say 'some'? It says 'earths water' which means all of it. It says that 'Previously, scientists have suggested...' implying that these guys no longer believe it. It doesnt mention this at all. -because you made it all up inside your head. Who you asking? Are you asking somebody to read the paper for you? Is this a joke or are you suggesting fusion is going on inside the planet? Actually, the isotope ratio of water in comets is different from the water on earth. Another theory is that Jupiter tacked toward the sun early in the formation of the solar system, dragging ice clouds into Earth's orbit and that is the source of most of our water. If that is true, then including the need of a really big moon to stabilize our rotation decreases the odds the of higher order carbon/water based life existing elsewhere in the universe. Not saying zero chance but much lower than was thought just a couple decades ago. It's been understood for a long time that the mantle contains a huge volume of water. However --it has been assumed that it was all chemically bound up as components of a few mineral species. Prior to these two discoveries, there hadn't yet been discovered any formally recognized mechanism which could produce H2O within the earth's interior after the Earth's formation, as it has been taken as a pretty reasonable expectation that any elemental hydrogen would have been driven out due to the extreme heat of the Earth's formation. Therefore, the hypothesis of cometary water has, until, now, carried the most weight in terms of providing an answer with fewer boundary conditions. Hydrogen is the most abundant element in the Universe, and is extremely reactive in all kinds of situations, and no doubt came to the Earth from different "sources", but it is not at all shocking that much -maybe most- was incorporated during Earth's formation. I've been unable to find an applicable reference to his question. You find one anywhere? I'd be happy to thank you, if you did. Stellar fusion is not, but gravitational compaction is. Which is one of a number of precursors to fusion. Additionally, neutrons are provided by stellar fusion. A portion of them make it to a "compactor" to be bound to protium, resulting in deuterium. Hey i bet its in the paper. Precursors to fusion... but not actually fusion -? Hey while you're looking for the paper try googling fusion in the earths core. Some people actually think its possible. And also LENR. You mean this paper (http://dx.doi.org....12.031) from the "more info" above? You just gave away that you didn't read the paper, yourself. Unless you think H2 means deuterium. Hint - it doesn't. Excuse me for not saying "Fusion PROCESS". Isn't LENR an ongoing fusion process? Quit implying "fusion" is only a huge, fast, high energy process. That kind of fusion is a result of a large number of much smaller simultaneous fusions. They're not fusing two atoms at a time, they're fusing millions . Humans only did it that way cuz we love fireworks.. Which creation story? There are thousands of them. I didnt ask the question and wasnt that curious. I have no idea. Nobody does. 4"Where is the promise of His coming?" they will ask. "Ever since our fathers fell asleep, everything continues as it has from the beginning of creation." It really is interesting to read all the vehement reactions against the idea of the creation story. People make all kinds of snide and unkind remarks against the person who raised that as a perfectly acceptable reason for the abundance of water everywhere. Then they proceed to spout the most nonsensical non-science reasons for the existence of such water ever to justify their belief in a self-made earth and universe. Those criticizing so over-enthusiastically should listen to themselves. The new theory offers an alternative explanation as to how the life-giving liquid may have originated on Earth. Obviously the idea that earth was bombarded by comets to supply all the water has always been lacking in substance, hence this effort at finding a far more substantive reason.I'm glad the scientists are at least willing to admit the truth even if it's in a round-about way and have as a result come up with some exciting discoveries. They just need to confirm this simulation in the real world, There are however, a lot more surprises in store.Earth was created in water and from water, of that there is no doubt. It just remains for human beings to acknowledge that they are created beings, not self-made, self-evolved animals. Life cannot spring up all by itself via random physical or chemical processes. The clue lies in the information contained in the biological life forms - such ABSTRACT information can only come from an intelligent mind, not pure physical means. No, i find it objectionable when people ask questions here that they are perfectly capable of answering for themselves with google or the link at the end of tge article. Especially people who ought to know better. So... use your prodigious searching powers and find the news headlines which proclaim that a theory of low temp nuclear fusion has been confirmed. Try looking under 'nobel prize'. Somebody acronized UFO and ESP also yes? Well then it would be all mooshy wouldnt it? And what about all that hot stuff at the center of it which you call 'hell' but your book calls a lake? Then he looked and behold, there was at his head a bread cake baked on hot stones, and a jar of water. So he ate and drank and lay down again..."
"12 And thou shalt eat it as barley cakes, and thou shalt bake it with poop that cometh out of man, in their sight. -which would explain why the human race is so filthy and disgusting. Vehement? They're quite tame. Creation story is...a STORY. For children (or people who just grow old but never grow up). People on here are just incredulous that someone like you - who actively comes to a SCIENCE site - is one of those that never grew up.